There are circumstances where a horizontal ceiling and attic space above do not meet the design needs of a building. In those cases, the assembly may be more compact, creating a pitched roof and sloped ceiling all in one, but all of the same barrier and ventilation needs must still be addressed. The common approach is to use roof framing members that are deep enough to carry the structural loads, fit the needed level of insulation in between, and still provide space for ventilation. In some climate zones, even a 2-by-12 rafter may not be enough to achieve all of that, so a deeper flat truss or other engineered member may be called into play. Regardless, the water barrier will still remain on the exterior surface of the assembly, while the air barrier and vapor retarder are along the inner face. Insulation is installed between the framing members to the level needed or desired depending on the type and corresponding R-value per inch (i.e., batts, spray foam, etc.). The depth of the insulation will be restricted by the need for a continuous ventilation space of at least 2 inches of depth that allows air to flow between the soffit and the ridge openings such that each framing space is ventilated (not every other space as some would purport). 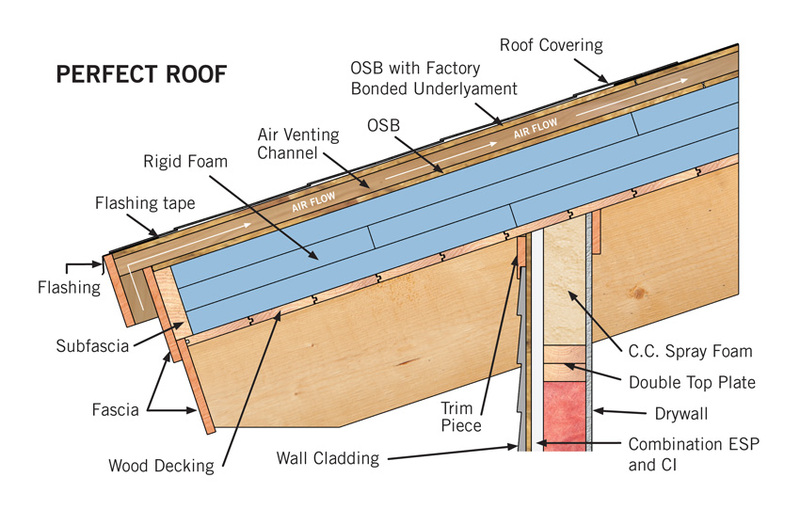 Commonly, continuous vent chutes or insulation barriers are installed along the underside of the roof sheathing to assure that ventilation space is maintained. If providing enough ventilation and insulation all in one framing member depth is not readily achievable, then the alternative is to construct an additional ventilation layer on top of the framing layer. In this case, the framing cavity is filled with insulation or rigid insulation is applied over a timber frame and ceiling system. A minimum 2-inch air space is then provided as an “over-roof” to carry away any moisture that escapes up through joints in the insulation. The ventilation space also helps keep the underside of the over-roof surface cold, thus avoiding snow melting and forming ice dams. Dr. Lstiburek recommends this over-roof approach when structural insulated panels (SIPS) are used too since the panel joints can be sources of air exfiltration from within the building. While this over-roof approach is effective for ventilation, it can be more costly to construct since it involves the creation of the ventilation channel that needs to support the sheathing and roofing water barrier. A top-vented insulated pitched roof includes rigid insulation with joints staggered and a 2-inch air channel to carry any moisture in the roof out through a ridge vent. This assembly uses a sloped roof/ceiling assembly with insulation filling the entire depth between ceiling and roof sheathing. That can be constructed of rigid insulation that is air impermeable (i.e., serves as an air barrier) between the inner and outer surface, such as closed-cell polyurethane or poly-isocyanurate with water-, vapor-, and air-barrier capabilities inherent to the insulation. This might also be achieved by spraying air-impermeable insulation completely between roof framing for the full depth. Or manufactured SIPS may be used if they employ air-impermeable insulation. In these cases, the roof system relies on the multiple properties of the insulation and other materials to form fully continuous air, thermal, and moisture barriers. Therefore, no ventilation is called for or provided. 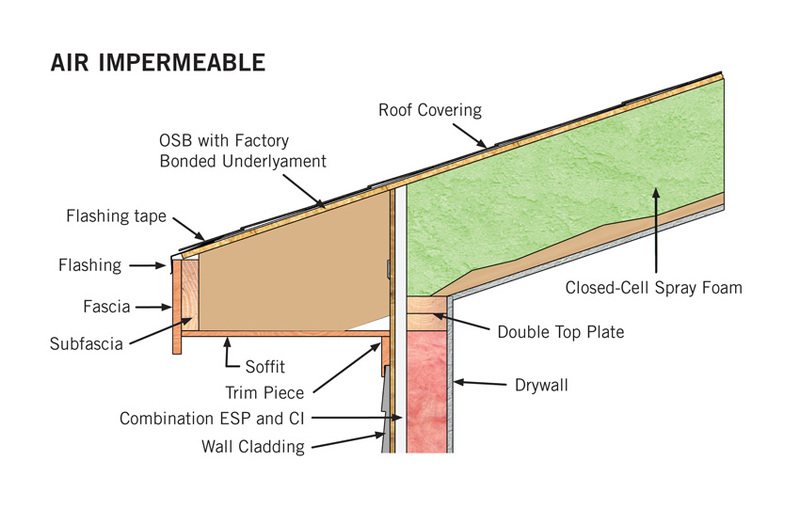 An unvented insulated sloped roof is one that commonly uses air-impermeable insulation in all or most of the space between framing members (shown as light green color in illustration), usually in the form of spray foam insulation. Most wood-framed building construction follows the International Residential Code (IRC), which provides significant detail on all aspects of wood framing. In particular, Chapter 8 of the IRC specifically addresses Roof-Ceiling construction, while Section R806 is focused on Roof Ventilation. 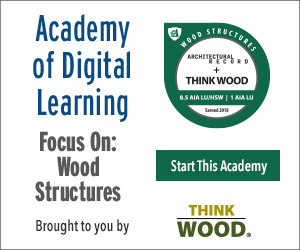 For light commercial or multifamily wood-framed construction, The International Building Code will apply. There, Chapter 12 addresses Roof Ventilation in Section 1202.2 and Table 1202.3. With all of these code references as a basis, we can review the relevant provisions as follows. IRC Section R806.1 and IBC 1202.2.1 both require “cross ventilation for each separate space by ventilating openings protected against the entrance of rain or snow” for both “enclosed attics” and “enclosed rafter spaces formed where ceilings are applied directly to the underside of roof rafters.” This is the basis for both the vented attic and the cavity-vented insulated pitched roof described above and influences the “over-roof” also described above. Each code also prescribes minimum vent area: “The minimum net free ventilating area shall be 1⁄150 of the area of the vented space.” In each case, exceptions are listed to reduce the amount of ventilation to 1⁄300 of the vented area provided certain conditions are met that would reduce the likelihood of vapor intrusion. Either way, the codes first identify and prescribe the minimum acceptable levels of ventilation for drying a vented roof assembly. In addition, both IRC R806.3 and IBC 1202.2.1 address the requirement for a minimum 1-inch clearance between the insulation and sheathing to provide proper airflow. Note that most building scientists will recommend at least 2 inches of clearance for best performance (i.e., more than the code minimum). Finally, the codes address the need for all ventilation openings to be designed and installed to assure appropriate weather protection and prevention of intrusion by insects, rodents, etc.